New Nike Flyknit Free give you two running innovations for the price of one. 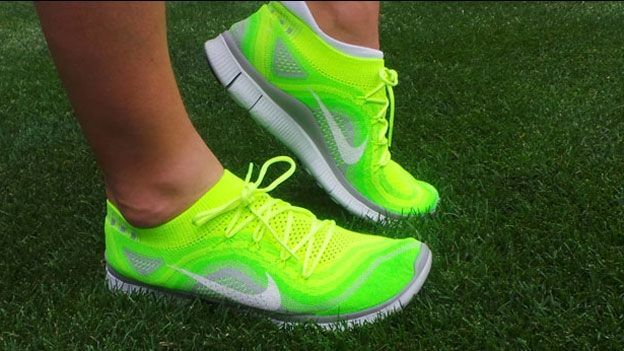 Nike today launched the new Nike Free Flyknit running shoes, putting two of it flagship running innovations into one new shoe that they hope will deliver the ultimate natural ride and a sock-like second-skin fit. The trainers mark the next evolution in Nike's Free Run range and combining Flyknit technology with Nike's hugely popular Nike Free+ 5.0 midsole. The new running shoes are the product of a new design ethos Nike is calling 'nature amplified', the concept of using data driven advanced sports science to strip away all but the essentials for optimum performance. The Flyknit technology - where the upper is woven in a single sheet and supported at key points by a Flywire frame - has been developed based on insights from the Nike Sport Research Lab, working with elite athletes using pressure mapping technology to identify and protect the key stress points during running. As with previous shoes likethe Flyknit Lunar 1+, areas on the top of the foot have been engineered to stretchand flex naturally when in motion, while a tighter weave at the edges gives added stability for the forefoot and heel. The additions of the Free+ 5.0 midsole provides a more natural, minimalist feel while maintaining mid-range cushioning, giving you a ride that falls somewhere between a barefoot experience and a standard cushioned running shoe. The articulated sole is also extremely flexible - it can literally be bent in half - and has been designed to move naturally with the foot. Diagonal hot-knifed flex grooves through the arch also helps keep your movement natural in the mid-foot as you transition strides. The Nike Free Flyknits will be compatible with the Nike+ running system. Nike Free Flyknit Release Date: The Nike Free Flyknit will be available globablly from 1 August. Nike Free Flyknit Price: The new trainers will cost $160 in the US, around £106 when converted but UK prices are yet to be confirmed.